Better Homes and Gardens is giving away a $10,000 check with the Pay Off Your Bills Sweepstakes 2017. Enter at www.bhg.com/10kbills for your chance to win enough money to pay off your holiday debt. During the Sweepstakes Period, visit www.bhg.com/10kbills, www.parents.com/10kbills, www.fitnessmagazine.com/10kbills, www.shape.com/10kbills, www.marthastewart.com/10kbills and www.eatingwell.com/10kbills and follow the instructions provided to submit a completed online entry form to receive one entry. There is no limit to the number of entries each individual can receive throughout the Sweepstakes Period, however you may only use one email address to enter this Sweepstakes each entry form submitted will result in one entry. Who Can Enter? 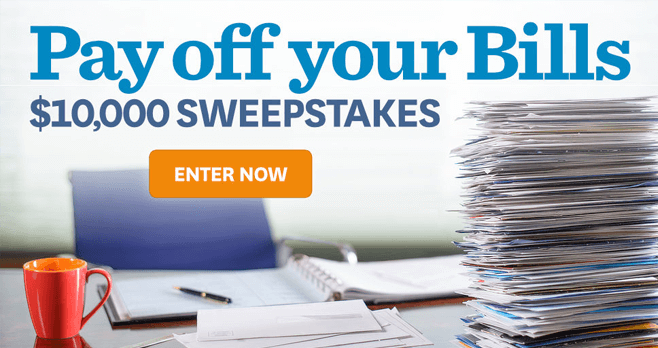 This Better Homes And Gardens Sweepstakes is open to legal residents of the 50 United States and the District of Columbia, 21 years of age or older. When To Enter? The Sweepstakes Period begins at 12:01 a.m. CT on 11/15/17 and ends at 11:59 p.m. CT on 2/28/18. What Are The Sweepstakes Prizes? The Grand Prize consists of a $10,000 check. Who Are The Winners? For the name of the winner, available after 3/31/18, send a separate, self-addressed, stamped envelope to: Winner’s Name The $10,000 Sweepstakes, 1716 Locust St., LS 321, Des Moines, IA 50309. I hope I win can I win will I win win win win big Winnie win how do I win what number I times do I win I want to win if I win and am to become a winner now I try to win then I choose to hit big so I can soar….